TUTICORIN: Power supply to the Sterlite copper smelter plant in Tuticorin has been cut after Tamil Nadu's pollution regulator found that the plant was "carrying out activities to resume production", violating orders in April to halt production. The action comes at a time the government is struggling to cap national outrage over the police killing 12 people protesting against, what they say, is pollution generated by the plant. The plant controlled by the London-headquartered Vedanta Resources has run into trouble with pollution regulators in the past but had survived. Local residents are demanding this time that the plant should be shut once and for all on grounds that it was a health hazard and polluted ground water. The smelter, which can produce 400,000 tonnes of copper, has been shut for over 50 days pending environmental clearances after protests against the plant intensified in the port city and drew support from celebrities and opposition parties. "The issue of renewal of consent for the year 2018-2023 has been rejected ... due to non-compliance of certain conditions," the pollution regulator said in an order late on Wednesday, according to news agency Reuters. Electricity department officials disconnected the power early this morning. The Madras High Court had yesterday also halted Vedanta's much-delayed plan to nearly double capacity at the Thoothukudi plant, which would make it one of the biggest copper smelters in the world. Chief Minister E Palaniswami, who had been accused of going soft on Sterlite and ignoring peaceful protests that had been on for 100 days, also announced the power cut. "The government is taking all steps to close the Sterlite plant," he said. 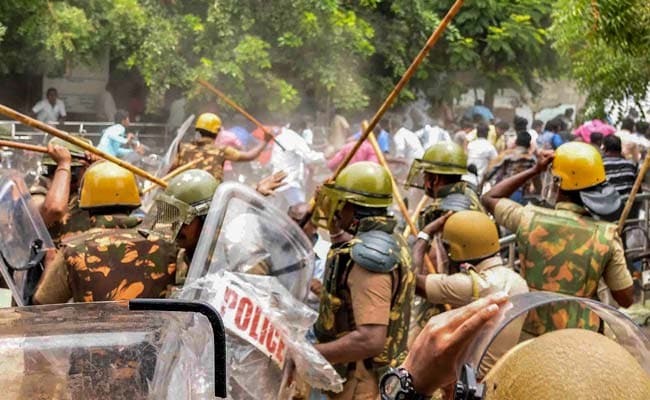 But the Chief Minister strongly defended the police action to shoot down 12 people and accused opposition parties of instigating residents of Tuticorin, officially known as Thoothukudi. "It is because of this instigation that so many people have died. And we are really saddened by the deaths," Chief Minister Palaniswami told reporters, his first comments after the police killed 12 people to control violent protesters. Union minister Rajnath Singh has asked for a report on Tuesday's violence and the police firing that Congress president Rahul Gandhi described as "murder" and "state-sponsored terrorism". Indian billionaire Anil Agarwal, who rose from a scrap dealer to a metal magnate and has 71 per cent stake in Vedanta Resources, was seen earlier to attribute campaigns against his company to a "foreign conspiracy" to keep India reliant on imports. Mr Agarwal, who is stepping back from running the company, has said they were "strictly following the orders of the court and the government" and were "totally committed to the people".